In an era of reboots where the common refrain is “That movie/tv show/book/other just ruined my childhood”, it’s heartening to see one that doesn’t. Even with promising preview trailers, a lot of skeptical – and previously burned – adults remained (very) cautiously optimistic. The actual film, however, instantly abates all fears and never once gives you pause if its about to go off the rails. Director Steve Martino, along with writers Bryan & Craig Schulz (yes, the grandson and son of that Schulz), Cornelius Uliano, and the team of animators have given us a Peanuts story worthy of the big screen that doesn’t betray everything we’ve loved about the ones on our small screens at home. The safe bet would’ve been to go with simple 2D animation and an all Vince Guaraldi score. The typical Hollywood bet would’ve been to go with a patented (and patently annoying) approach of trying to make it wacky, zany, and crude, laced with pop culture references. 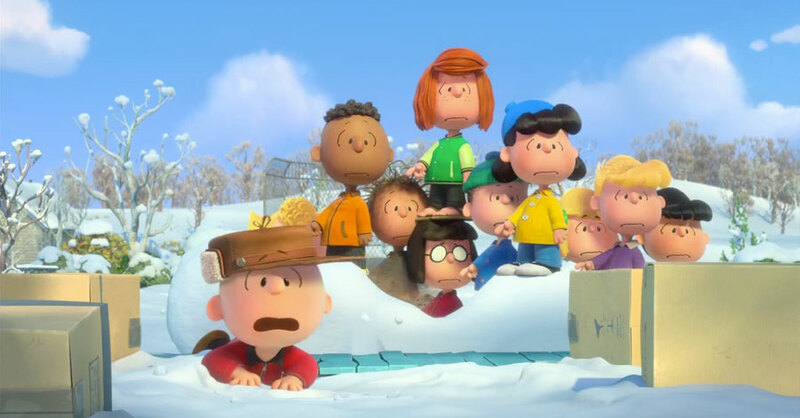 Thankfully, The Peanuts Movie is neither safe nor typical, but inspired. Sure, it’s not a bold risk-taker either, nor should it be. But it makes some calculated gambles that pay off, which is a testament to the assuredness of Martino’s vision and the faith in Charles Schulz’s enduring sensibility. There’s an episodic nature to parts of the film, especially at the beginning, with strip-length nuggets and jokes, along with classic bits from holiday specials that are cribbed verbatim. But these are just comfort-food morsels, not the narrative foundation. Instead, a full story arc unfolds that uses Charlie Brown’s crush on the Little Red-Haired Girl to communicate some valuable life-lessons in an organic (not didactic) and ultimately moving way (yes, I teared up, okay!). And even through Snoopy’s WWI Flying Ace side-story, along with other splashes of comic relief, hearts are also tugged by tender moments between a boy and his dog. Through Charlie Brown – the ultimate sad-sack loser who can never do anything right or accomplish any dream – the story gently delivers themes of building confidence through determination and hard work, and of still having the courage to do the right thing even when rewards could be unjustly granted. And most importantly, it confronts the universal fear of letting people see you for who you really are, and simply says “Let them.” Some may think you’re weird, and not everyone will like you – but the right people will. They reveal themselves when, as some make fun of your true qualities, the right people admire them. The animation style reflects a 2D quality within this 3D update, maintaining the strip’s classic form while giving it more detail and texture. 2D facial expressions (eyes/eyebrows/nose/mouths) are applied over 3D modeled heads, honoring the ink-drawn aesthetic. All colors are vibrant, the shading adds both shape and warmth, and movement varies from smooth to a subtle stop-motion, further honoring the source’s handmade appeal. The Peanuts Movie proves that a cherished piece of pop culture, even one venerated with loads of nostalgic sentiment, can be updated while still respecting (not sacrificing) the very things that make it great. It doesn’t get neurotically PC either, thankfully not opting to censor terms like “blockhead” because of some absurd over-protective silliness. With keen talents like those at Blue Sky, we don’t have to be afraid of ruining our childhoods; we can pass on our cultural heirlooms, even as they’re reimagined, confident that what we’ve long cherished will not only be enjoyed, but preserved.